While my east coast friends are dealing with the first snow of the season, I am enjoying a warm and (mostly) sunny weekend in Hawaii. My main reason for visiting is head-scratching to most people I talked to. It seems rather silly to fly 10 hours each way to rack up on mileage points. Of course I would love to stay longer but with my trip to Denmark earlier this year, I have already depleted all of my vacation days at work except for one. So here I am in Honolulu for a weekend. This is one of those vacations that I have nothing planned in my itinerary. 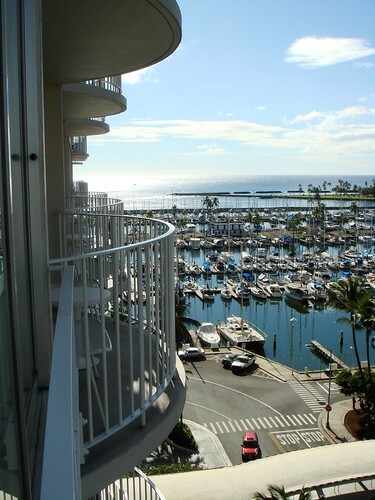 I've been to Honolulu ten years ago so have seen some of the must-see attractions. I'm here to relax and just indulge in activities I enjoy (which may or may not include a dip in the ocean. Seriously, I'm not much of a swimmer). Upon arriving at the hotel yesterday, I took a long time just chilling in my room with no hurry to get out until hunger eventually took over. You see, all I had during the eight hour long flight from Chicago to Honolulu was a yogurt parfait. It was one of the best yogurt parfaits I ever had with thick Greek yogurt, blueberry compote, homemade granola, dried sour cherries, and cajeta. 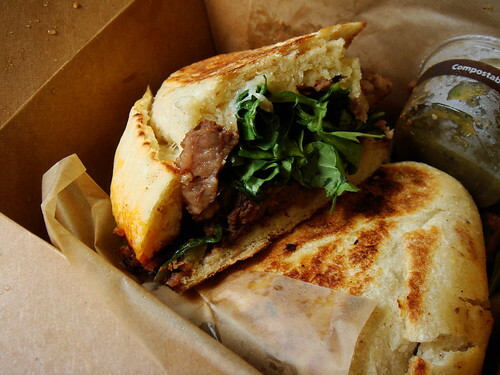 What a treat from Tortas Frontera! But still, it was far from enough. So yes, a rumbling tummy eventually drove me out of the posh and comfortable hotel room in search of ramen. 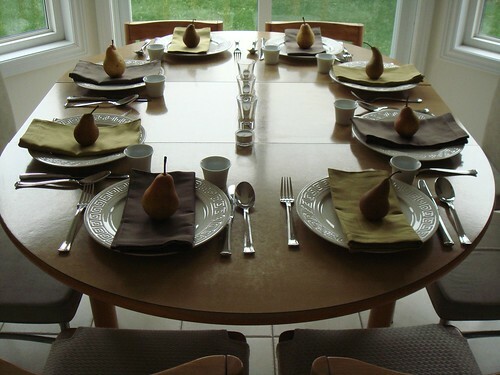 I’ve been chosen to host an America’s Test Kitchen “Food & Friends” dinner party, cooking from the Provencal Bistro Menu of their upcoming Menu Cookbook. The last couple of days I’ve been busy with preparation and now the big day has finally arrived! You are welcome to follow along my progress by the twitter hashtag #ATKDinner. My effort so far involves cooking some of the dishes in advance but mainly my biggest task is to make sure my house is clean and welcoming to friends. As much as I love the lived-in look of books piled high on the coffee table and opened mail on the counter, I don’t want to leave my guests searching for a spot to set down their drinks! 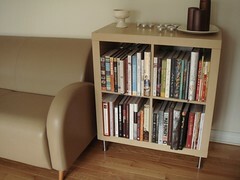 The clean up is mostly done and I even got a new bookcase for the family room to house all my new cookbooks. My collection has long ago exceeded the capacity of the study upstairs! With new toy comes new culinary landscape to explore. This is how I felt the minute I set my shiny new slow cooker on the kitchen counter. Whether you know it as Crockpot or slow cooker, this piece of small kitchen appliance is nothing new to the North American kitchen. I’m pretty sure generations of newlywed received one as a gift since the days it was introduced as the next greatest invention for convenient home cooking. Like most inventions, slow cooker has fallen somewhat out of fashion but it is still useful when it comes to cooking for a crowd, preferably without much fussing over. This is the reason I finally made the leap to join the slow cooker club. The onset of colder temperature means comfort food will once again take over my menu. Chillies and stews and soup and braises are all things I love to cook and eat. And don’t forget beans! 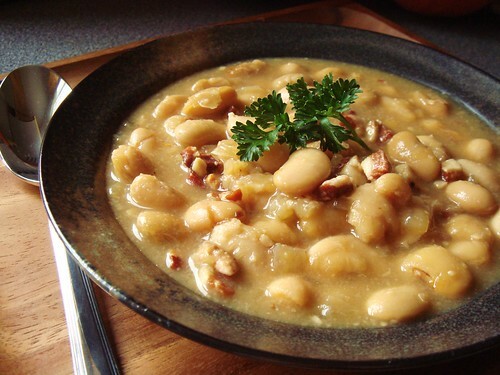 They are crucial to my mostly vegetarian diet and there are few things more comforting than a big pot of creamy beans. I am particularly fond of the heirloom beans from Rancho Gordo. The taste and quality are simply unmatched. Even though they are more expensive than what you find in grocery stores, they are still significantly more budget-friendly than cheap cuts of meat. If only there is an easier way to get them in Canada! One drawback about beans is the long cooking time. I rarely plan ahead enough so I often find myself staying up late at night until the pot of bean finishes cooking. With the help of my new toy, convenience can be mine at last. Browsing the small kitchen appliances section is a huge exercise in self control. The practical side of me knows that half of what I see is useless and frivolous. Who needs yet another single-purpose machine to take up precious kitchen real estate? However, the shopaholic side of me cannot help but squeal “OMG! A cupcake maker for making cupcakes! And that mini deep fryer! I can make apple fritters on demand! And what about that soft serve machine with built in sprinkles dispenser!” Well, you get the idea. 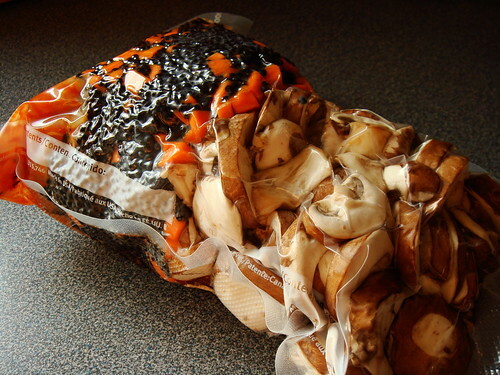 However, one small appliances that I have been eyeing for years is the home vacuum sealer. This gadget totally screams late night infomercial but I can think of many practical uses in my kitchen. A few years ago, I even bought one but in the end returned it to the store because I simply couldn’t justify the purchase. This month, I finally made the plunge and I couldn’t be happier. I only wish I bought it earlier. Every year I face the same dilemma with my annual road trip to Chicago. I visit one of the greatest dining destination in the US yet I always end up eating at chain restaurants. What a shame! When we arrived on Friday night, we had dinner at Chili’s. As for Saturday, Macaroni Grill. Did I just lost all my credibility as a food lover? The truth is, my purpose for visiting Chicago is for a big inline speed skating race. Traveling with fellow skaters means seeking out good eats is far from top priority. Convenience plays a huge part because most people would rather head back to the hotel early to stay well-rested. Familiarity is also important. There are many unadventurous palates and even for those who would be enticed by interesting dining, we tend to choose feeding over dining. 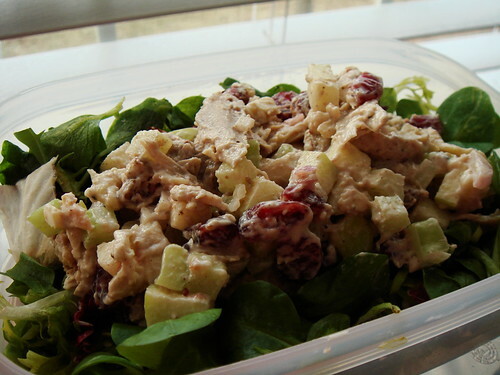 We fuel our bodies with familiar and healthy food to best prepare ourselves for racing. It is not the time to travel far for that hole in the wall with incredible exotic food. The athlete side of me knows that I am doing the right thing but it certainly doesn’t mean the food lover side is not cringing with embarrassment. Another way to fuel myself with healthy food is to bring my own. That is the reason why I tend to pack bentos more often in summer when traveling to races is frequent. 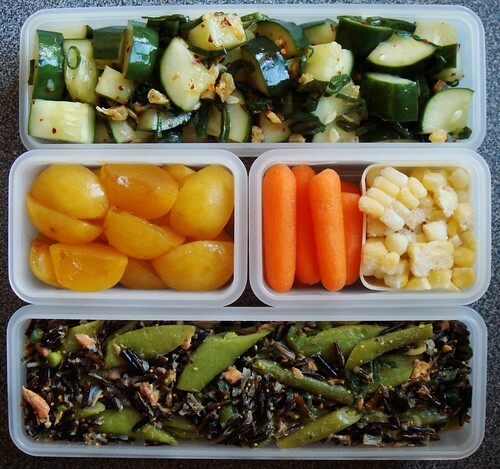 This weekend, for example, I packed a “clear the fridge” bento for the road trip to Chicago. The Wild Rice Smoked Salmon Salad already made its appearance once in another bento. This was the last remaining portion. I supplemented it with a simple spicy cucumber salad with dried shrimps and sesame oil. Some sweet corn, baby carrots, and yellow plums completed the meal. It’s not fancy nor coherent but it was something nourishing and wholesome to eat compared to highway rest stop fare. The weekend of racing has been going alright so far but we are dealing with plenty of uncertain weather and rain. Hey, but at least I know I’ve been fuelling my body with healthy food. I don’t realize how much time I spend on my feet cooking away in the kitchen until my feet forces me to take a break. Since Monday night, I have this pain in my left foot when I put any weight on it. It goes away temporarily if I rest my foot but the pain comes back after a few minutes of standing around. My guess is that that the half marathon on Sunday triggered an inflammation so rest is necessary until it heals. In the mean time, I am not doing much cooking. It’s frustrating because I cannot bear to sit around for long stretches of time without getting something done. But I know enough to respect injury management so I can get back to doing things I love as soon as possible. Luckily, I do have some food-related tidbits to share. 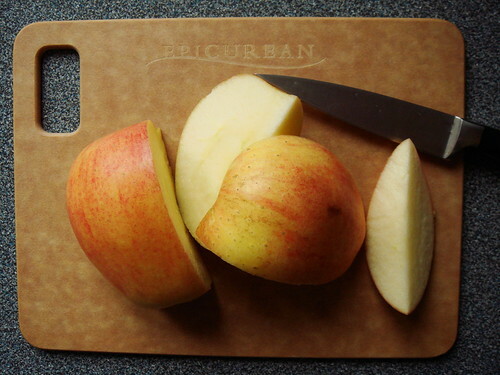 I’ve been eyeing the Epicurean cutting boards for some time because they claim not to harbour bacteria. Their suggested retail price is rather expensive and I don’t see it as a good deal since I already own decent wooden chopping board at home. However, as I get more paranoid about cross contamination, I’m starting to feel a more pressing need for additional cutting boards. I went to HomeSense (the Canadian equivalent of TJ Maxx) in search of Le Creuset enamelled cast iron pieces. Of course, as the way things go, they had none but I spotted a good selection of Epicurean cutting boards in various sizes for 35-40% off. That was as good a reason as any so I bought a large one measuring 15x11 and a small one of 8x6 for $16.99 and $7.99 respectively. BF and I celebrated Valentine’s Day a few days late since we live in different countries. Upon arriving at his place, I was greeted by the sweetest note and some very thoughtful gifts. It is often said that guys don’t pay much attention and us girls have to drop very obvious hints. I felt very lucky that he has been paying attention to the little things all along when I wasn’t even hinting. 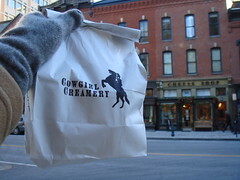 On my last visit, we went to Cowgirl Creamery and I had high hopes of buying their famous Mt Tam cheese. Unfortunately, it was sold out during the holiday season and I returned empty-handed. Well, not exactly empty-handed because I did enjoy a whole bag of Red Hawk, Pierce Pt, clabbered cottage cheese, and fromage blanc. Disappointed, yes. What a sweet surprise that he returned to the store weeks later to get me a piece of Mt Tam! One of our favourite haunts in the area is Cheesetique. We always stop by their cheese & wine bar for dinner whenever I visit. Back in December, I was browsing their store and had a big crush on all the gorgeous wooden cheese boards. I casually mentioned my preference for wooden serving pieces because of the warmth of the material and the smoothness of a well-polished piece. I didn’t buy any since I could barely close my suitcase as it was. Truth be told, wooden cheese board is something I can easily purchase back home in Toronto. 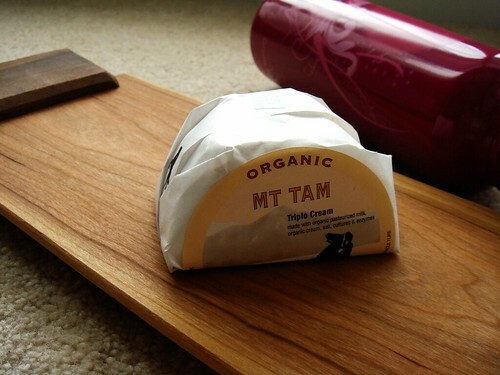 However, BF took it to heart and got a beautiful rectangular board to accompany the piece of Mt Tam. With all the studies coming out on the harmful BPA in plastic water bottles, it seems like aluminum water bottle is the latest workout accessory. It also helps that most aluminum bottles come with graphic design to suit any taste. I’ve been holding out on getting one and I don’t even know why. I guess BF decided to put an end to my indecision and got me a pink one with sports cap. There are many ways to a girl’s heart. Unlike things such as chocolate or jewellery that have universal appeal, I feel lucky to have a guy who pays attention to everyday little details. These gifts speak uniquely of our time spent together and so hold special meaning. To me, this Valentine cheese sure beats any chocolate treats! Last night little brother and I enjoyed a dinner that I put together using standard ingredients in my kitchen. What made it special was that I cooked without any recipes. My baking background trained me to follow recipes with precision so cooking by intuition is a big step for me. It was scary and liberating at the same time. 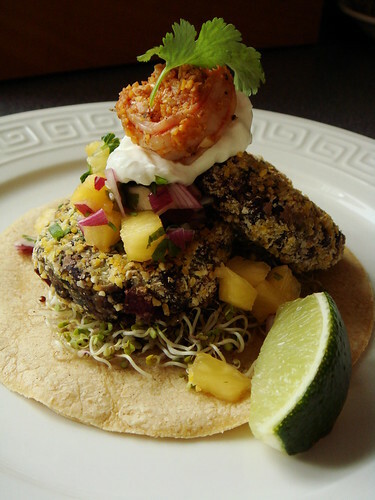 We enjoyed a light dinner of black bean cakes with pineapple salsa and jalapeno shrimp served on soft corn tortilla with sour cream. Although delicious, I had no plans to extract a recipe while I was cooking. It started off with chopping pineapple, red onion, cilantro, and jalapeno for the salsa. A squeeze of lime juice and some salt and pepper made the pineapple salsa tasted right. Then I moved to the black bean cake mixture. I drained the black beans that I cooked in the morning, nicely flavoured with epazote. I mashed some of the beans and tossed them together with fresh bread crumbs, sautéed red onion, garlic, and celery, chopped cilantro, cumin, chipotle powder, salt, and an egg to bind everything together. Each patty was formed by hand and dredged in cornmeal. I pan fried the patties until golden on both sides and finished them off in the oven while I tended to the shrimp. I shelled a bunch of tiger shrimps and was going to quickly sauté them with chopped jalapeno and garlic. However, I eyed the leftover cornmeal and decided to dredge the shrimps too. While the shrimps were cooking, it looked a little dry so a blob of ketchup, a splash of Worcestershire sauce, and a squeeze of lime juice gave them a sweet tangy taste. This is how most people cook, a handful of this and a shake of that until things look and taste right. Hard to imagine it’s taken me all these years to warm up to this cooking style. Perhaps that’s what people meant by the fundamental difference between cooking and baking?